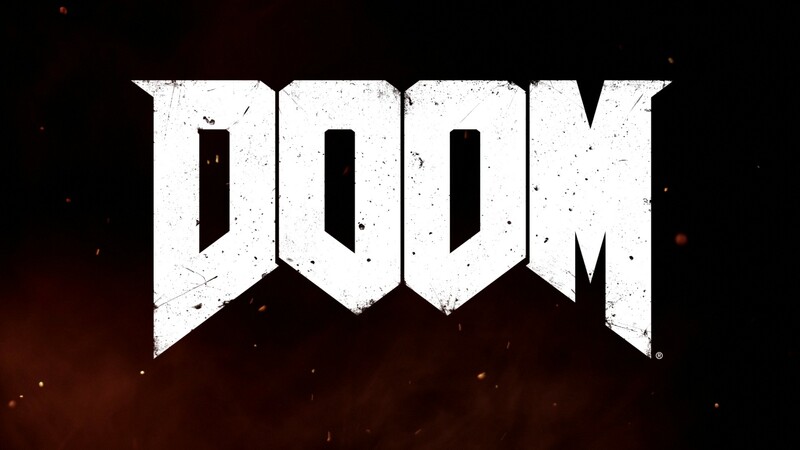 I can’t imagine what went through Bethesda’s minds when they greenlit a Doom remake for 2016. In 1993, the original Doom blazed trails for the FPS genre and is universally regarded as a watershed moment for gaming’s lurch into mainstream culture. Challenging Id for a remake that honours the original while still standing out from the wave of shooters released since is no small ask. Thankfully, Id has brushed aside all expectations to deliver an uncompromising vision of exactly what a "Doom" game should be in 2016. 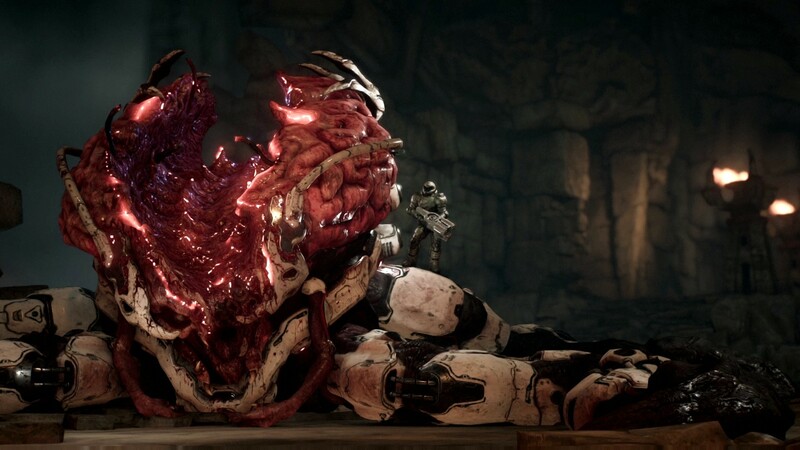 "Doom"’s cold open is your first indication that this isn’t just another corridor shooter. Our hero (aptly named “The Doom Slayer”) emerges from a stone sarcophagus with orders to close a portal from hell that scientists mistakenly opened to solve an energy crisis. Yeah... it’s not a terribly engaging hook but Doom’s subversive storytelling makes it clear that it’s not supposed to be. Within minutes, Doom Slayer is smashing audio logs and disregarding any specific directions barked from your guide. The way "Doom" constantly alludes to these genre staples then sidesteps them completely is refreshing and empowering as a player. Over the course of the game, your travels between intergalactic space stations and the depths of Hell are punctuated by beautifully-realized worlds. Id deftly captures feelings of isolation and you-against-the-world mentality in Mars’ research facilities, and the spires of Hell capture a neo-gothic feel that hasn’t been matched since 1993’s original. References to the original "Doom" are abound in the form of hidden tokens and secret passages complete with a glitch-metal soundtrack. The way the music ratchets up on each kill and adds guitar riff flourishes to glory kills keeps you pumped. And for those wanting to dive deeper, there’s plenty of lore to uncover via the detailed codex library, just don’t expect any extended cutscenes to develop character or plot. Perhaps most telling of "Doom’s" respect for its predecessors, the gameplay really takes centre stage here. Generally speaking, the minute-to-minute is very simple: kill enemies, move onto the next room, repeat, but the constantly evolving encounter design keeps things fresh and exciting through the campaign. The arenas are exquisitely crafted, making great use of vertical and horizontal space, with character and enemy movement responding accordingly. Doom Slayer has a generous clamber ability that allows him to chase down or kite enemies that deftly wind their way through the varied environments. The most interesting addition to the series is the “glory kills.” Whittle down an enemy’s health to near-zero and you’re rewarded with the opportunity to dispose of them with a gory animation and bonus health pickups. The kills are not only incredibly satisfying, but add a whole layer of complexity to gun-play strategy. Alright, enough about systems and platforming. 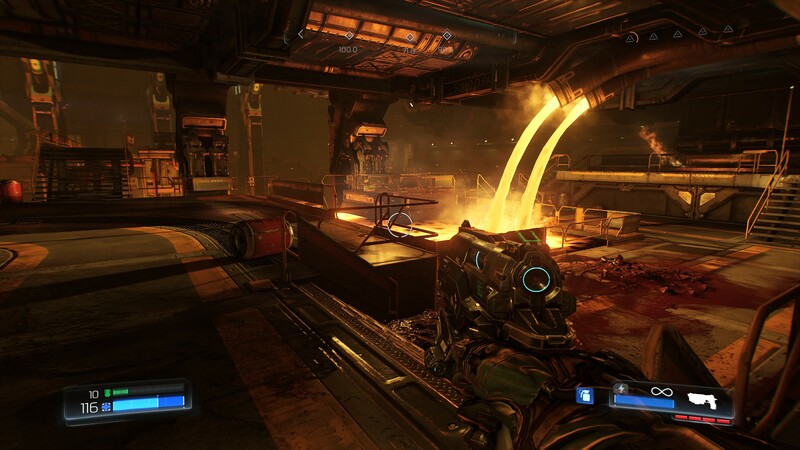 We know what you came to "Doom" for: an arsenal of weapons and frenzied combat. Thankfully, those staples have arrived perfectly intact. The drip feed of new weapons and upgrades is paced throughout the campaign so that you never quite feel comfortable. These upgrades are added instep with new enemy types, forcing you to constantly adapt your play-style on the fly. You’re regularly scoping health/armor and ammo pickups as you enter each new area, as you’ll find yourself starving for both on a regular basis. Aside from a few moments where the path to the next objective wasn’t entirely apparent, "Doom’s" gameplay proves Id learned the most important lessons from the original. For as amazing each of the game’s components are, Id’s efforts are truly greater than the whole. 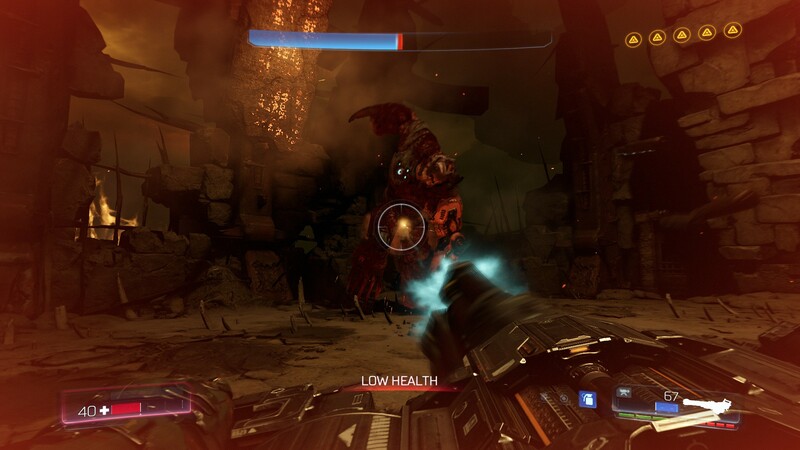 "Doom" demands an aggressive play-style, constantly swapping weapons and charging enemies with the fires of hell at your back. This destructive gameplay is echoed throughout all elements of the game’s presentation, from the ghoulish tone to the screaming soundtrack. The series that pioneered a genre has done the near-impossible in once again pushing shooters forward in a meaningful way.